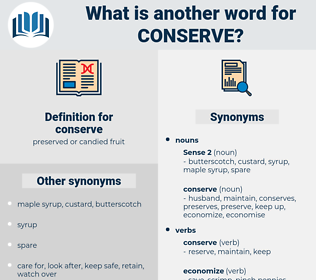 What is another word for conserve? savings, save, economise, uphold, upholding, economize, defend, reserve, spare, perpetuate, receive, nurture, reduce, skimp, remain. conservation, preserve, retain, preserving, maintain. destroy, spend, use, waste, release, let go, squander. fritter, throw away, impair, damage, disregard, consume, injure, wreck, drain, ruin, exhaust, lavish, ignore, deplete, hurt, expend, clean, neglect, harm, impoverish, break, use up.
" We haven't space for the head as a trophy, of course, you know," he said, " and I don't approve of shooting for sport, but caribou is good eating, and it is always wise to conserve supplies." 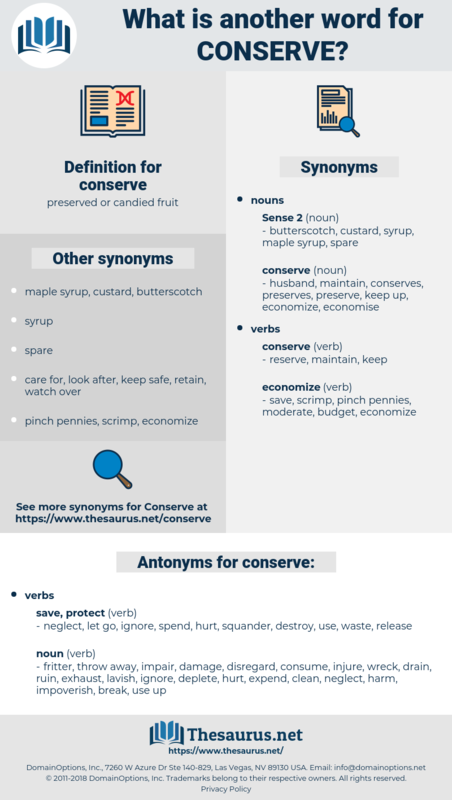 Where is the conserve, Peggy? Cyano Group, cymograph, Congreve, cosmography, chemisorb, conjure up. apple butter, jelly, lemon curd, marmalade, jam, chowchow, lemon cheese. plastinate, hold the line, embalm.